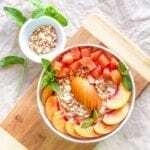 Enjoy every bit of summer with this juicy Summer Stone Fruit Smoothie Bowl. It’s the perfect way to use up your ripe peaches, apricots and plums, but if they don’t happen to be in season, know that frozen ones work just as well! Blend everything except the toppings until completely smooth.